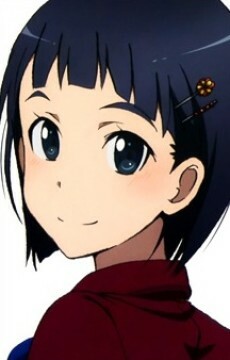 Kazuto's sister in the real world. She is 15 years old and in her third year of junior high, as well as a member of the Kendo club. She's a diligent worker and has been practicing Kendo for 8 years. In the VRMMO game Alfheim Online, she is known as Leefa, a Sylph fairy. She stumbled onto Kirito by accident one night and decided to travel with him to the World Tree. She eventually fell in love with him because he showed that he really loves playing VR games as if living in it and is very honest in everything. In the real world she slowly got closer to her brother (actually a cousin) but because they're family and because he already got Asuna as a girlfriend she decided to give up on him and fall in love with Kirito instead. But soon afterwards she realized that they're the same person. After being convinced by Kirito to have a fierce duel which ended up in them flying in each others' arms, she decided to help Kirito in rescuing Asuna.